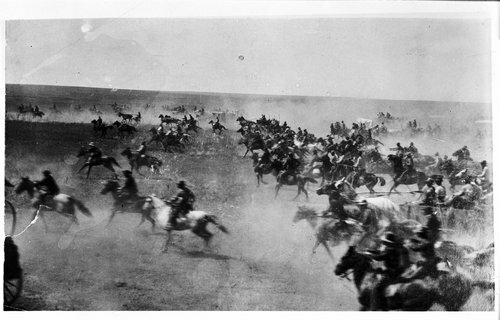 This black and white photograph shows the Oklahoma land run. The image taken at noon on September 16, 1893, indicates the opening of public land to white settlers in the Indian Territory of Oklahoma. Under the Homestead Act of 1862, a settler could claim 160 acres of land if they lived on the claim and made steady improvements to it. If those requirements were met at the end of five years, the homesteader could file for the title of the land with the United States government.